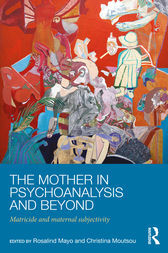 Our first is a hugely timely collection of essays – The Mother in Psychoanalysis And Beyond, Matricide and maternal subjectivity, co-edited by Rosalind Mayo and Christina Moutsou. It is vigorously academic exploring our relationship to the maternal through psychoanalysis, philosophy, culture and art, as well as politics and gender and profoundly touching, as half the book is the reflective, lived experience of women on being mothered and mothering. It is a handbook to understand the contradictions of motherhood, the conflict between the dreams of motherhood and reality. The book grew out of a series of seminars on the maternal open to psychotherapists and members of the public, held at the Philadelphia Association in London. An institution founded by R.D. Laing in 1965 to challenge established ways of thinking. It became clear through the meetings that there was an enormous chasm between the idealisation and reality of motherhood – there was so much that was unsaid. This book breaks that silence. It examines the myths that illustrate ‘…the conflicts and dilemmas of our collective relationship with the Mother,’ as Christina Moutsou outlined at the book launch. Athena who leaps fully formed from the brow of Zeus after he has raped and swallowed her mother, a daughter born of matricide, and Persephone stolen to the underworld, while Demeter roams in winter, the forgotten, stripped out older mother. But it also unfolds the political landscape, the failure of feminism to support motherhood in the past, the undermining of motherhood, the perpetuation of impossible zeal. Contributing their voices are writer and journalist Melissa Benn, feminist theorist Amber Jacobs and conceptual artist Eti Wade as well as eminent psychotherapists Alison Davies, Kate Gilbert, Jane Haynes and Lucy King, not to mention the editors who have both contributed to and shaped this brave and honest book. To be a mother is at once the most intimate, profound and universal of our experiences. Our own mothering cannot be separated from our own experience of being mothered. It is the most ambiguous and ambivalent of relationships as well as the most enriching. The mother relationship can render us paper-thin, vulnerable, exposed to slipstreams of uncertainty, separation, betrayal and loss, aching to fulfil the impossible idealisation and fantasies of the mother in our society. This is a rich, moving book of courage, a handbook to understanding. Review by Belona Greenwood, founder and co-organiser of Words and Women. A former journalist she took an MA in Scriptwriting at the University of East Anglia and writes plays for adults and children, produced and performed both regionally and nationally. She is co-director of Chalk Circle Theatre Company. In 2009 she was a winner of the Decibel Penguin Prize for Life Writing, and she has won an Escalator award to write a book of creative non-fiction. She teaches adults and children.